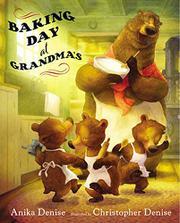 A rollicking, rhyming salute to the grandmother-grandchild bond. Three independent, bundled-up young bears set off across the snow and past the pond for Grandma’s cottage, all smiles, as “It’s baking day at Grandma’s!” Everything at Grandma’s house—from the fire and old-fashioned stove and Victrola to her pink shawl and the woodsy cabin decor—points to coziness and love, and the ursine facial expressions reflect that. Though the adding of ingredients isn’t shown, Grandma’s role in the baking of the cake is limited to reading the recipe, and she even has aprons for each of the grandkids (though in one spread, they are inexplicably missing). While the cake is baking, there’s hot chocolate to drink and frosty windows to draw on. “Old-time music, soft and sweet, / Skippy notes and tapping feet. / Learning songs that Grandma sings— / When the kitchen timer rings!” But this cake isn’t for eating; the siblings carefully decorate and wrap each piece as gifts. As darkness falls, the children bundle back up, share more hugs with Grandma and are off under the full moon for home, basket full of treats in their sled. Christopher Denise’s Photoshop illustrations are a mix of cartoony characters (though they are more real-looking than most anthropomorphized bears) and realistic settings, especially the snowy winter scenes between home and Grandma’s.